I think you're a lovely, charming person. I really do. 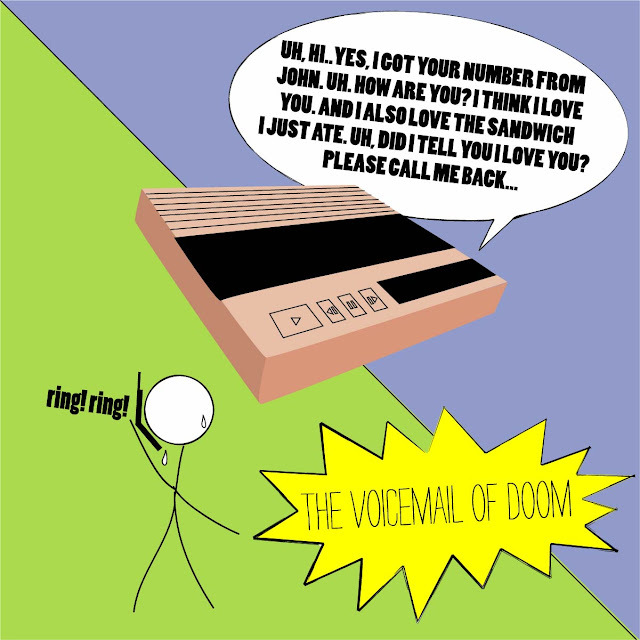 But under NO CIRCUMSTANCES should you EVER, I repeat EVER, call a guy without a completely scripted voicemail message. You were never good at improv on the stage, and are especially bad at it when attempting to leave a laid back, confident voicemail for some guy you've never met. You will say things you can never take back. You will stutter. You might repeat the same sentence twice (even though you're only saying about 4 sentences total)...You will be lucky if you make any sense at all. And you will most likely inspire him to never call you again. BE PREPARED! Don't leave these things up to chance! Do you think the writers of any hit TV shows leave their scripts up to chance? NO WAY! Not even REALITY TV is left up to chance, SAM! In fact, if at all possible you should avoid the phone all together. Email is a much better venue for you. You have a way with words, you really do. Anyway, I wish you all the best! Good luck, and let me know how it all goes! P.S. Remember this? Did anyone ever actually use that? The "Rap" is definitely my favorite although I found the "scary" one to be quite frightful. i can't imagine you like that, but i love it. Oh yes! trust me, I am terrible at voicemails. All my instincts shut down..I avoid it at all costs!! For years I hated calling up random people (in stores to find out what time they closed, etc) because I couldn't get my words out then either. I've improved a lot though, thankfully!